If you've been looking for a way to ditch your car, HP Velotechnik's new Scorpion fs 26 S-Pedelec electric trike could be a suitable replacement for your daily commuter. 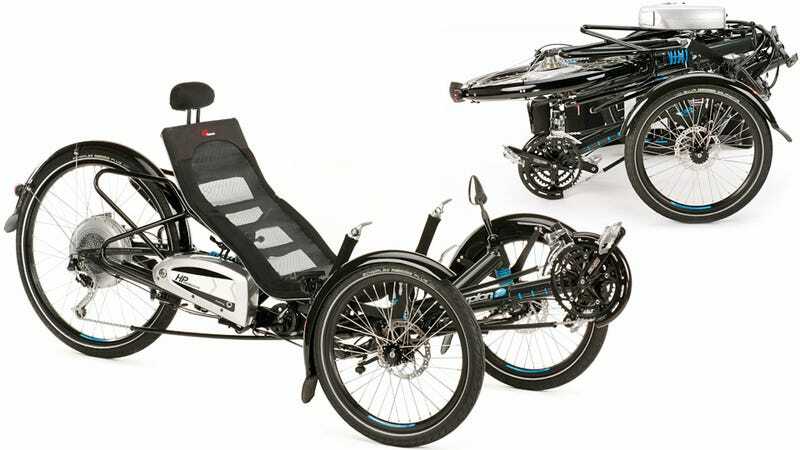 Despite a mouthful of a name, the motor-powered recumbent can hit a top speed of 28 miles per hour, while still folding away into an impossibly small package for easy storage. When it's available early next year in the US it will sell for almost $7,500, which unfortunately prices it similar to a decent used car. But for that hefty sum you do get car-like features such as hydraulically coupled disc brakes, an electric starter that will propel the bike up to almost four miles per hour at the push of a button, and a full suspension system for tackling the most pot-holed of roads. You'll never need pay for a drop of gas either, just five or six hours of electricity every night. And finding and paying for parking is a thing of the past since it folds small enough to drag up to your office when you get to work.